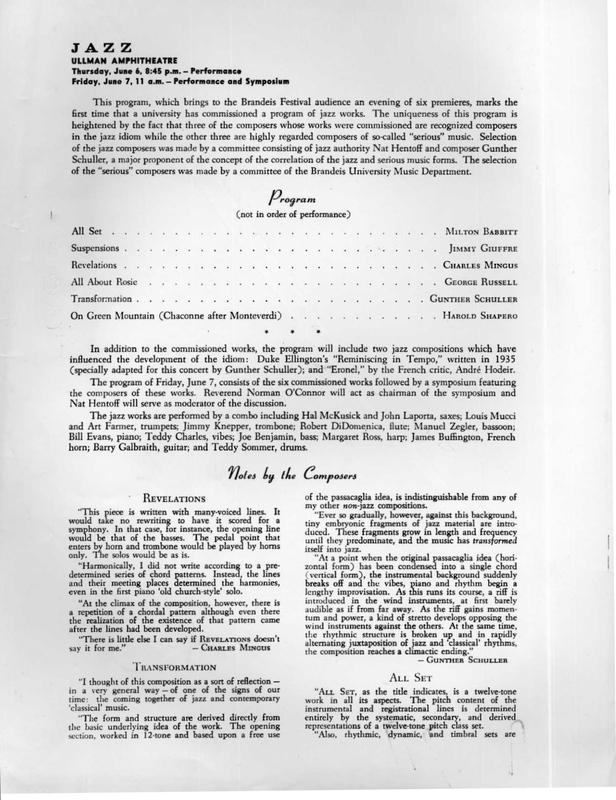 Regarding the Brandeis Festival recording, it wasn’t mentioned (although it may have been inferred) that not only did they rehearse those pieces over a couple of weeks, but they performed them live at the actual Festival of the Arts (campus of Brandeis University) on June 6 & 7, 1957, a few days before going into the studio (June 10,18 & 20) back in NYC. Most of the same musicians that ended up on the recording performed those concerts. However, I’m not sure if Mingus participated as a player on his own composition. He was certainly present at the Brandeis concerts. Fred Zimmerman, Mingus’ teacher, was perhaps only asked to help out on the recording and therefore, leaving Mingus to tackle his own arco parts for the concert performances. The first concert was outdoors under damp early evening conditions so you can imagine how much the musicians must have struggled with the elements, intonation, etc. The second concert was the following morning (11am start….again, not ideal), but this was supposedly held indoors in, of all things, a gymnasium (acoustics must have also been challenging). Judging by some of the reviews, they were able to pull off some very difficult music under very suspect conditions. The reviews of those concerts bear this out. Of course, one wishes that these concerts would have been recorded. For instance, it would have been great to hear how Bill Evans evolved his solo on “Rosie” from concert to recording. Speaking of which, curiously enough, there are two takes of “Rosie,” one from the June 10th recording date and one from 10 days later. I suspect they chose the latter take or edited together bits from both takes. George Avakian, the producer for that date, was known for his early experiments in editing by that time. The Brandeis recording received 5 stars in Downbeat when it came out. The same with Music for Brass and Lewis’s Golden Striker. Third Stream Music and Abstractions received 4 1/2 stars — not sure if this indicates anything profound or not! About the Atlantic recordings and the possible extra takes from the Abstraction session — unfortunately, there was a major fire in Atlantic’s warehouse in Longbranch, NJ back in 1978. Many of their master tapes along with numerous alternate takes from the legendary sessions of that time were lost in that fire including the Ornette sessions from the late 50s/early 60s: that’s why that box set (Beauty is a Rare Thing) has virtually no alternate takes added, just the ones that were issued. 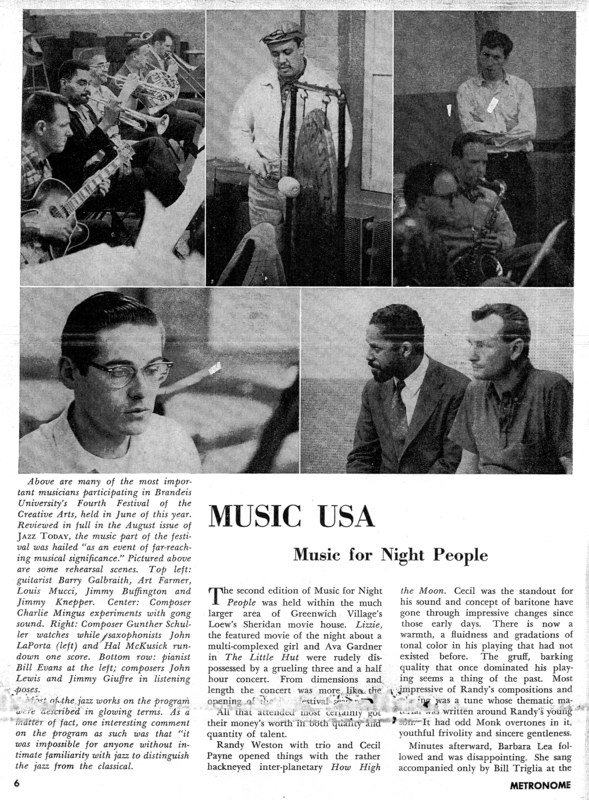 This is in reference to the Traveling Third Stream Troubadours that Gunther organized in the early 60s, going to various US cities to perform a mix of Classical, Jazz and Third Stream. Lukas Foss was the director of the Ojai Festival in those years. Initially, Lukas wanted Ornette for the festival, to perform his own music and to play some of Gunther’s Third Stream works, but by that time Ornette perhaps was already charging a hefty price for his services. 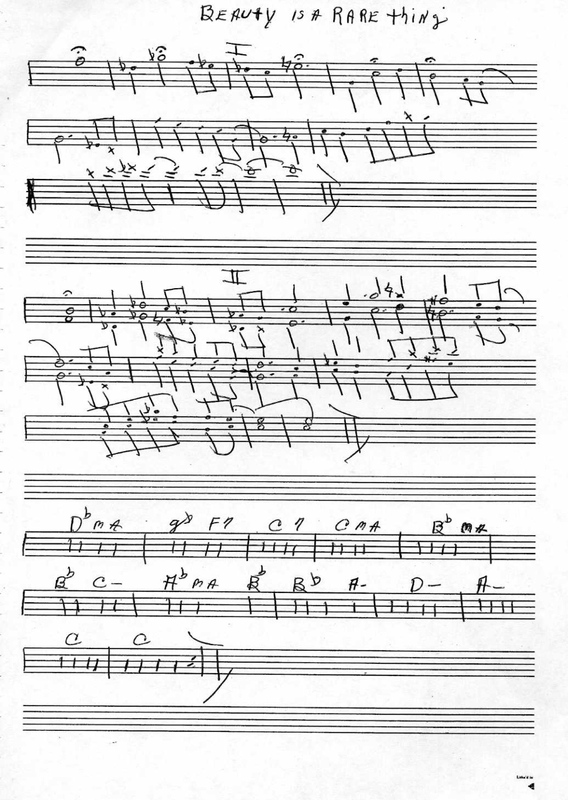 These are hand-written charts that were assigned to Gunther to edit Ornette Coleman’s compositions for the 1961 folio published by MJQ Music. 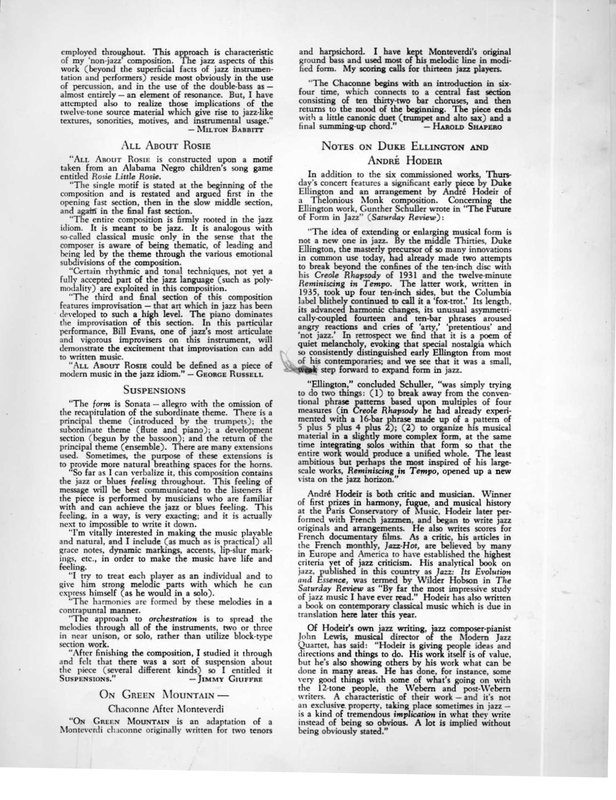 There were ten compositions included in that first volume. It had been assumed in recent years that Ornette was the one who had been responsible for writing out the batch of charts (above) for Gunther for further editing. But much of the evidence now points to Don Cherry as the one designated and best suited to prepare these charts at that time. Don most likely would have come up with the occasional harmony parts, key signatures, the use of bar lines as well as a few suggested chord changes for certain heads, bridges and solo sections. At best, Ornette could have titled the lead sheets in his own hand writing leaving the music portion to his closest associate. To further amplify this notion, there’s some evidence of Ornette’s half-script / half-print writing style posted in a memo that was reprinted in the booklet for the Ornette Coleman box set of the complete Atlantic recordings, Beauty is a Rare Thing (pg 52). Of course, more research is required. Gunther may have used many of these lead sheets as a kind of crude template, but his guiding force were the actual recordings from the first couple of Atlantic releases (The Shape of Jazz To Come and Change of the Century). “Ramblin'” and “Child of the Century” were published for MJQ Music as separate lead sheets. The others (except for perhaps “Humpty Dumpty”) were included in a second volume published in 1968. Gunther was not the editor for that publication. “Bird Food” shows what Don probably wrote out (top portion) with Gunther’s own penciled-in transcription underneath (the first draft so-to-speak). “Beauty is a Rare Thing” shows the melody (or head in) as a single line and then with Harmony added on the head out (part 2)…the way they played it on the original recording from This Is Our Music. 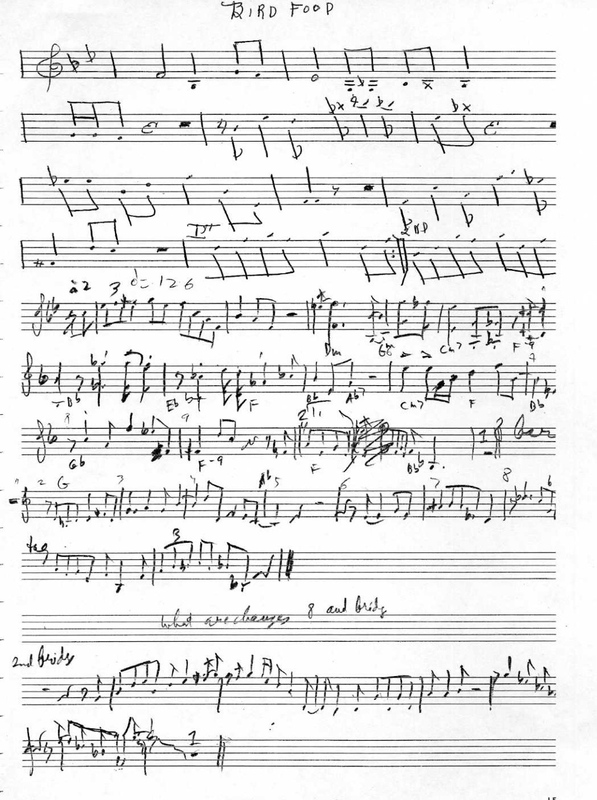 Don may have added changes to accompany the melody at the bottom as a suggestion, although it’s difficult to say whether they had any specific purpose. Charlie Haden certainly had another idea of what roots to play on the actual recording. Note that Ornette plays the harmony part on the head out leaving Don to play the melody. This was probably a short documentary that they made back then during the last stages of rehearsal and preparation for the premiere. The footage was discovered (maybe rescued) 3 years ago by a woman who works at 3sat (TV Network) in Zurich, Switzerland who sent a DVD copy to Gunther. The complete film last 22mins. I hope to someday get it translated. The first clip will show some of the behind the scenes activities as well as a rehearsal bit with McHenry Boatwright in the lead. The other clip shows Gunther rehearsing the jazz group with a brief interview of Gunther explaining the jazz elements of the opera. This is precious and rare footage, and probably the only film that exists of anything having to do with The Visitation. Lets hope that somebody will find the 1970 telecast of the BBC production in their archives just like the folks at 3sat did with the short doc. By the way, some of the other jazz musicians who were involved with the San Francisco production (1967) include John Handy, Mike Nock, Albert Stinson, and Doug Sides. 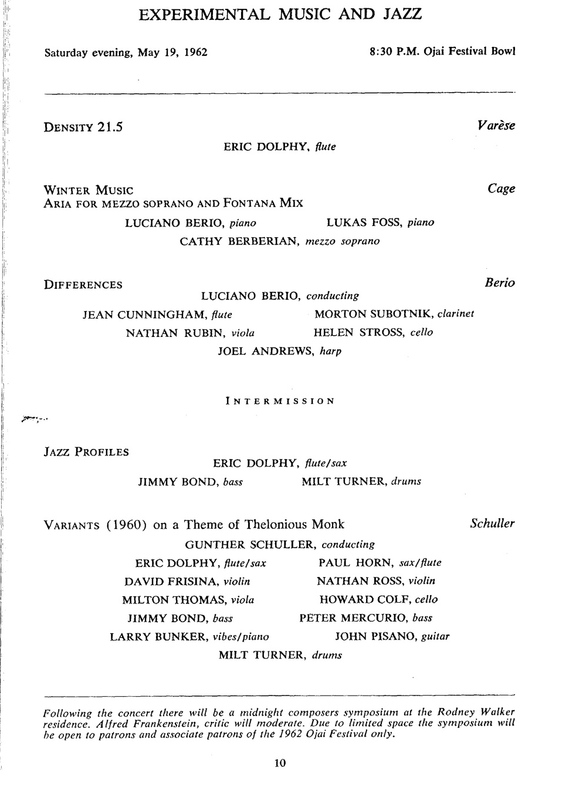 For the University of Illinios production (1968), the only recognizable musicians listed were bassist Thomas Frederickson and trombonist Morgan Powell. The legendary John Garvey helped with the rehearsals of the jazz group. “Contours” was definitely premiered by the Cincinnati Symphony Orchestra Dec 31, 1959 & Jan 2, 1960. What we have not been able to do is nail down when the live performance (probably in Carnegie Hall) of “Contours” was recorded by the Contemporary Chamber Ensemble with Arthur Weisberg conducting. That ensemble was formed in 1961 so it could have been anywhere between the early 60s to roughly 1975. The LP came out in 1976 on Odyssey (subsidiary of Columbia), but as you know, there’s no information regarding location and date in the liner notes and credits. The other pieces were probably recorded between 1974-75 (Maderna had died in late 1973). My hunch was that Contours was performed somewhere in the late 60s / early 70s, but I’ll have to scour the Schuller Archives in Newton to see if I can find the original tape or a program of that performance. Furthermore, Gunther thinks it was recorded by an amateur music lover sitting in the audience who happened to offer to record the performance with his state of the art German recording equipment. Now how this person got away with that in Carnegie Hall is still questionable and probably impossible without detection if it was not sanctioned by the hall management. They tend to run a tight ship over there. Anyway, Gunther is quite certain that the recording was not an in house job (engineer Stanley Tonkel was mentioned as somebody who could have slid a recording into Gunther’s hands as a favor). He also remembers having to convince John McClure (a major record producer for Columbia Records) that the recording was good enough to be released. Even though Gunther was listed as producer for the recording, McClure probably called the shots. As a side note to the Magic Row and the fact that Ran Blake has been using it lately in his private teachings and performances, Eddie, my brother, recorded a composition he wrote based on Gunther’s row called “Big Daddy’s Magic Row Blues” on his CD called To Know Where One Is (GM Recordings).